Despite being low-cost, the Kilobot maintains abilities similar to other collective robots. These abilities include differential drive locomotion, on-board computation power, neighbor-to-neighbor communication, neighbor-to-neighbor distance sensing, and ambient light sensing. Additionally they are designed to operate such that no robot requires any individual attention by a human operator. This makes controlling a group of Kilobots easy, whether there are 10 or 1000 in the group. The Kilobot was developed by the prestigious Harvard University and it is now produced and distributed by K-Team. Kilobot is a low-cost, easy-to-use robotic system for advancing development of “swarms” of robots that can be programmed to perform useful functions by coordinating interactions among many individuals. These swarms are inspired by social insects, such as ant colonies, that can efficiently search for and find food sources in large complex environments, collectively transport large objects, and coordinate the building of nests and bridges in such environments. Following this inspiration from nature, robot swarms might one day tunnel through rubble to find survivors, monitor the environment and remove contaminants, assist dwindling bee populations in pollinating crops, and self-assemble to form support structures in collapsed buildings. The Kilobot is designed to provide scientists with a physical testbed for advancing the understanding of collective behavior and realizing its potential to deliver solutions for a wide range of challenges. The Kilobot can communicate with neighbors up to 7 cm. 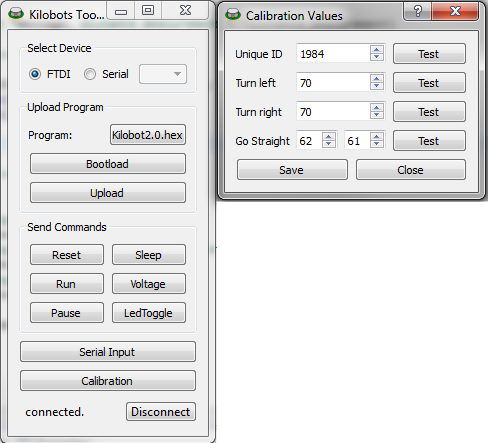 control hundreds of Kilobot at one time. 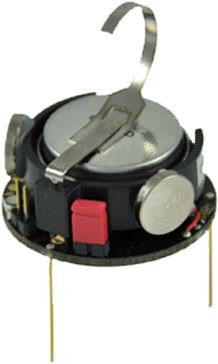 Battery Rechargeable Li-Ion 3.7V, for a 3 months autonomy in sleep mode. About 2.5 hours in standard use with motors. applied to any of the legs, and GND is applied to the charging tab. light off the ground surface. The brightness of the ambient light shining on a Kilobot can be detected. differential drive of the robot. Each motor can be set to 255 different power levels. Programming For programming, the open source development software WinAVR combinated with Eclipse gives a C programming enviromnent. An API with basic functions such as motor speed, led control, distance measurement,… is available and some examples are provided. Debug A serial output header is available on each robot for debugging via computer terminal. 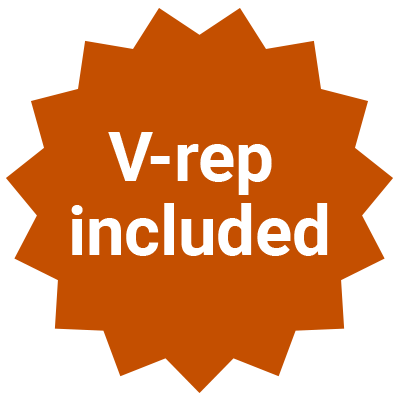 Simulator V-REP, realistic 3D Simulator and robot programming (included for education), with Kilobot model. The open source development software WinAVR combinated with Eclipse gives a C programming enviromnent. An API with basic functions such as motor speed, led control, distance measurement,… is available and some examples are provided. This section is dedicated to the new Kilobot firwmare based on the Kilobotics version. All the Kilobot delivered after February 2016 with a serial number above 3000, will be already programmed with this version. For previous version, the manual and files can be found under the Old Manual / Download section below.